1. $5 meals: I will attempt to make almost every meal less than $5 per serving. Allowing of course for the occasional splurge on special occasions and dinner guests. Hey, if that Melissa d’Arabian lady can make entire dinners for a family of 4 for $10 (although usually with copious amounts of gluten), I can pull this off. I LOVE me some Chipotle, so in an effort to not make this too hard on me, I came up with today’s recipe. It is easy to make and is just what a girl needs to overcome that Chipotle craving. There are three components to these burritos bowls – Slow Cooked Southwest Chicken, Cilantro Lime “Rice”, & Guacamole Slaw. Regular guacamole would be just fine too, but I improvised tonight when my avocados were not quite ripe enough for mashing, and I had some extra shredded cabbage that needed a home. I really liked the results and hope you do too! 1. For the Southwest Chicken, whisk together the chicken broth and spices and then pour over the chicken thighs in a slow cooker. Cook on low for 5 hours. Note: If you don’t have a slow cooker or don’t have 5 hours to burn, you can really cook the chicken however you would like (grill it, chop it up and pan fry it etc). I like to make it in the slow cooker because it is super easy and so very tender. 2. For the Cilantro Lime “Rice”, start by “riceing” the cauliflower in the food processor. It you have never done this before you might want to check out this Everyday Maven page for the play by play. Really simple, I promise! 3. Chop the cilantro, zest the lime and mix it in with the cauliflower. Put the cauliflower rice mixture along with the chicken broth, lime juice, butter, salt and pepper in a rice cooker and cook for about 10 minutes or until tender (stir one time once the butter has melted). Note: If you don’t have a rice cooker you can also just throw the ingredients in a medium size pot over the stove and cook until the cauliflower is tender. The rice cooker just seems easier to me (and it is the only way I get to use this beloved little appliance anymore). 4. While the rice is cooking, work on the Guacamole Slaw. Place the shredded cabbage in a medium bowl and add the lime zest, juice, salt and pepper. Stir together and let macerate while you prep the rest of the ingredients in #5. 5. Chop the cilantro, onions (both the white and green parts), garlic and jalapeno Halve the cherry tomatoes and cross-hatch and scoop out the avocados (here are some tips). 6. Once everything is prepped, gently toss all the slaw ingredients together. 7. When the rice is finished it is time to prep the bowls! Layer the rice on the bottom of the bowl, and cover with chicken which should be very tender and shred easily. 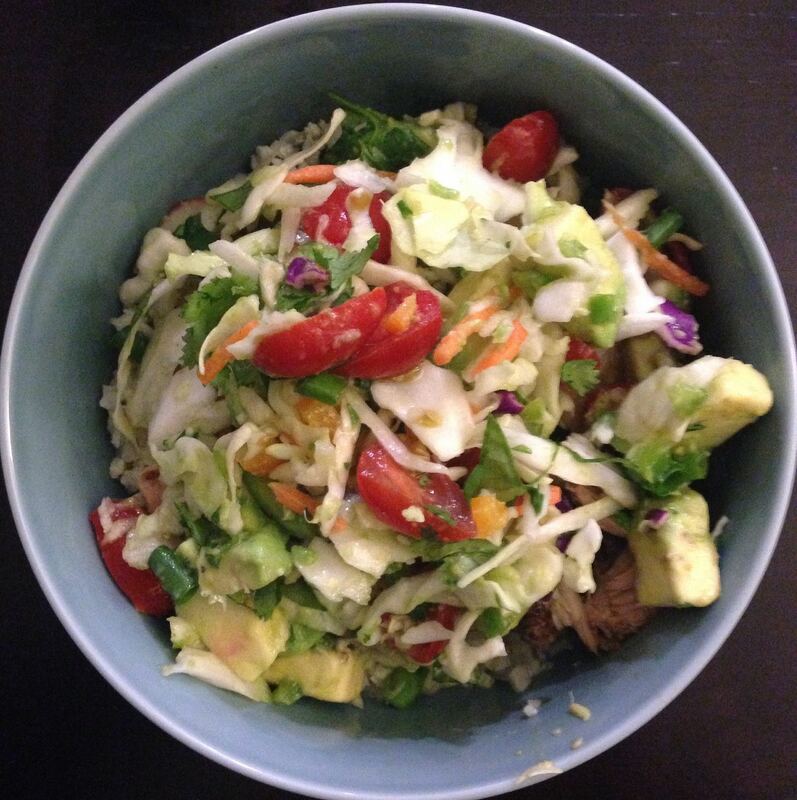 Top it off with a healthy scoop of the slaw and enjoy! !